So what explains the distribution of federal taxing and spending? As you can see from the map, states that get the “worst deal”—that is, have the lowest ratio of federal spending to taxes paid—are generally high-income states either on the coasts or with robust urban areas (such as Illinois and Minnesota). Perhaps not coincidentally, these “donor” states also tend to vote for Democrat candidates in national elections. Similarly, many states that get the “best deal” are lower-income states in the mid-west and south with expansive rural areas that tend to vote Republican. News reports commonly interpret this to mean that “red state” lawmakers are more successful at bringing home federal spending than “blue state” lawmakers. It’s often suggested that the way to correct this imbalance is for “blue state” lawmakers to step up efforts to capture additional spending for their states, and for “red state” lawmakers to pare back their voracious appetite for ever-growing pork-barrel spending. This interpretation may be appealing, but it’s probably wrong. The much more likely factor driving the persistent imbalance between federal taxing and spending isn’t the relative ability of lawmakers to “bring home the bacon,” but is the fact that higher income states bear a larger fraction of the federal tax burden—an imbalance that is sharply amplified by the progressive structure of the federal income tax. For whatever reason, so-called “blue states” tend to be high-income areas that pay the vast majority of federal taxes. Some 84 percent of federal individual income taxes—which account for over 40 percent of federal revenue—are paid by the those in the top 25 percent of the income distribution. The majority of these taxpayers live in wealthy, urban, politically “blue” areas like New York, California, and Massachusetts. Even if federal spending were equal in all states, wealthy states would still send substantially more federal tax dollars to Washington than they received in spending, simply because they earn a majority of the nation’s income. This disparity is greatly magnified by the progressive rate structure of the federal income tax, which taxes higher income states more heavily than low-income states, regardless of the level of spending received. Still think the problem is not enough federal spending in “donor states”? Consider the table below. In 2004 federal discretionary spending was about $895 billion. 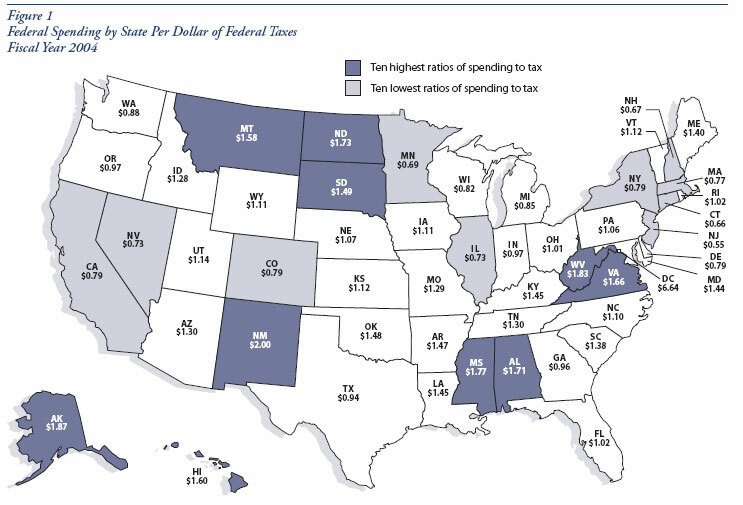 How much would the largest “donor states” have had to receive in federal spending to boost their spending-taxing ratio to New Mexico’s 2.0, the biggest “beneficiary state” that year? As the table makes clear, far more than is realistically possible. California alone would need to receive more than half of the nation’s discretionary spending. The lesson? The distribution of federal taxing and spending is mostly driven by tax burdens, not the ability of lawmakers to divert spending to their home states.